I think you look absolutely adorable in this beanie! And what a cozy sweater - perfect for these chilly temps! I am so jealous that you are done! I have a feeling mine will be coming down to the wire this year! You look so cute in that beanie and I love the black and brown color combination. So jealous you finished your Christmas shopping--I am only about halfway done! Also I NEED this sweater! 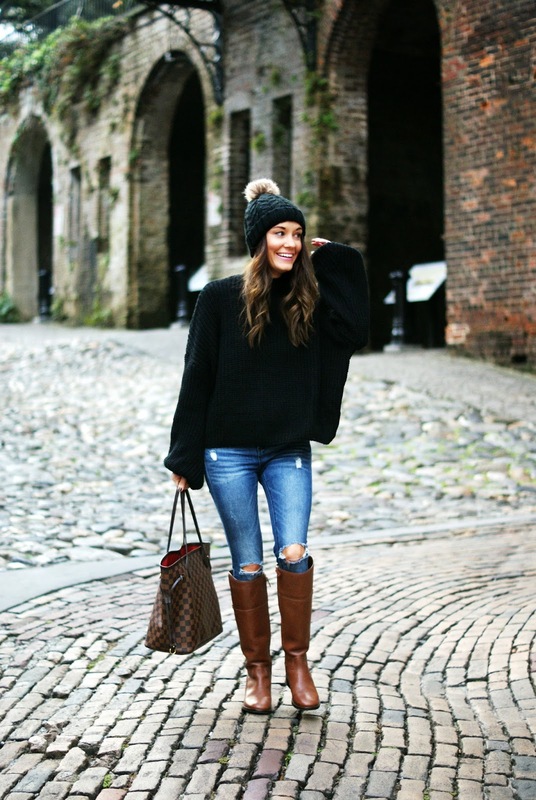 LOVE the big slouchy style of it! So cozy! Yay for being done and the gorgeous outfit. Way to go with the Christmas shopping! I'm only half way done. Gotta get moving on it. Love your outfit and that hat looks fab on you. you are way way ahead of me, girl! Still so much to do! Love the sweater and can’t believe the price! And the beanie is too cute on you. 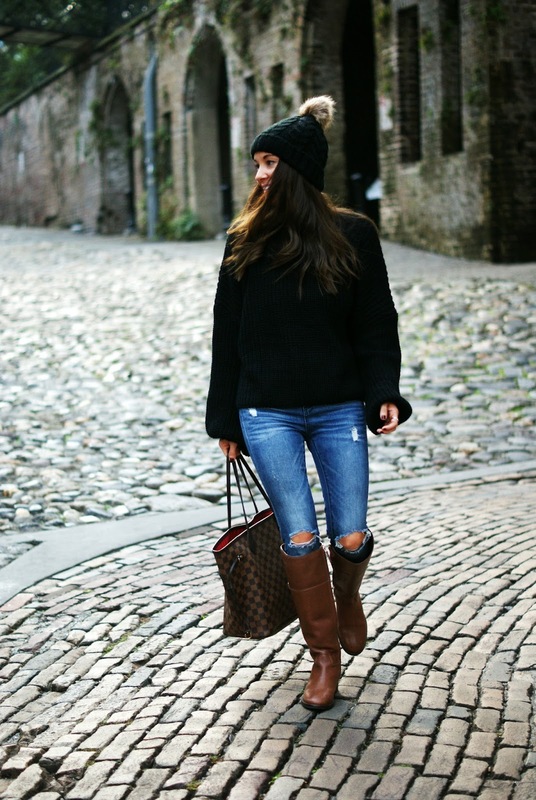 Such a cute winter look, love it! So jealous you’re done shopping - I still have a ways to go, too! Love this look! 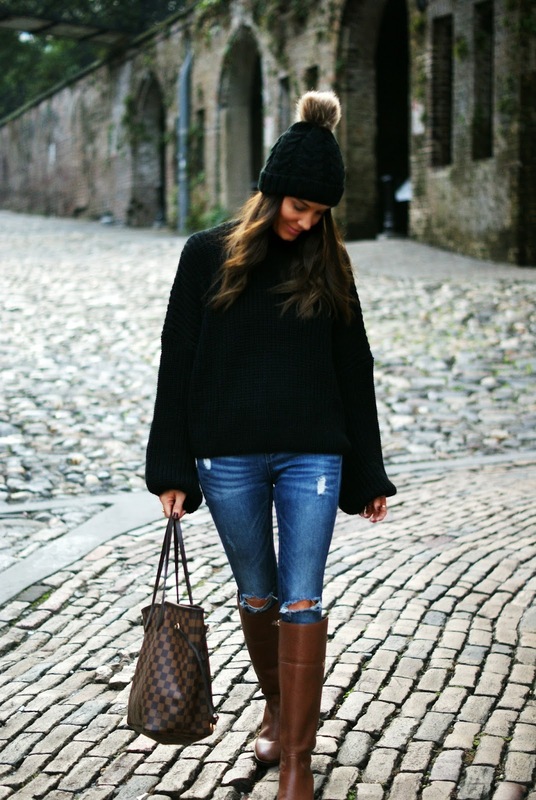 Black sweaters with brown boots gives me major heart eyes. And YES to finishing Xmas shopping! 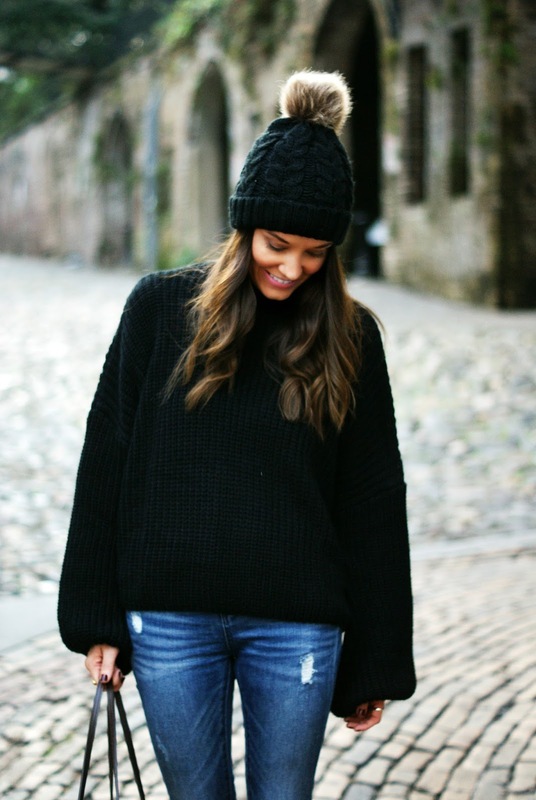 What a cute and cozy outfit! I always love the black and brown color combination. Yay for finishing your Christmas shopping! Isn't it the best feeling in the world?! Congrats on finishing shopping! I just have my dad and Mike's dad left to go. I love your sweater - looks so cozy. It's actually been nice enough to wear cool weather clothes in the South - I can't believe it! Congrats on finishing Christmas shopping, what a great feeling! That sweater looks so cozy! I need one for this cold weather, finally! Congrats on being done with your shopping! I've been picking up a few things here and there but know Christmas will sneak up on us before we're done. Obsessed with how warm and cozy that sweater looks. I hope Novie is doing well! Silly?! Are you kidding me -- you look fabulous!! I love everything about this look! Way to go on getting your shoooing done! I got quite a bit done yesterday but we still need to shop for Chris’s side of the family! And I love that beanie! It’s so cute! I can see why that would be your favorite sweater! It looks so cozy and the fit is slouchy! Yay! It must feel so good to be done! Now you can relax + enjoy the season! This is adorable on you! Obsessed with your beanie but I’m pretty sure I’d look crazy in one!